Take a maze-like journey through the International Space Station in this fisheye 4K Ultra HD video recently recorded aboard the orbiting research outpost. The tour begins inside the space station’s cupola, a windowed extension where astronauts control the research lab’s Canadian-built robotic arm. The Italian-built cupola, launched aboard the shuttle Endeavour’s STS-130 mission in February 2010, gives station crews panoramic views of Earth and an unrivaled view of approaching supply ships like SpaceX’s Dragon, Orbital ATK’s Cygnus and Japan’s HTV cargo freighters. 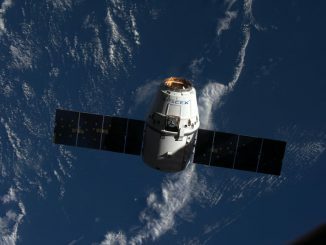 A Cygnus spacecraft and Soyuz crew capsule are seen outside the cupola, along with portions of the station’s huge set of solar arrays, which cover half the area of a football field. Produced by Harmonic, the video next shows a trip through the Unity module, the oldest U.S.-built piece of the space station, which was launched by Endeavour’s STS-88 mission in December 1998. The next stop is the Russian-built Rassvet module, delivered to the space station aboard the shuttle Atlantis on the STS-132 mission in May 2010. The camera takes a look inside a Soyuz crew capsule docked to Rassvet, where the crew’s Sokol launch and entry spacesuits are stored. The camera then meanders into the tunnel-like pathway inside the Russian-made Zarya module, the first segment of the International Space Station shot into orbit atop a Proton booster in November 1998. Zarya, which means sunrise in Russian, is also known as the Functional Cargo Block, or FGB, and was manufactured with U.S. funding. Zarya initially provided basic control functions for the early years of the space station, and the module is now used mainly as a storage area for food, waste and other equipment. 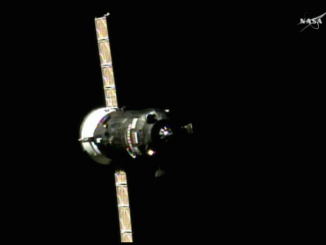 The tour does not visit the Zvezda module, the heart of the Russian part of the space station attached to the aft port of Zarya. Next up is the U.S.-built Destiny laboratory, home of many of the space station’s key life support systems and research racks. The shuttle Atlantis delivered Destiny to the space station on the STS-98 mission in February 2001. A straight shot through Destiny takes the tour to the U.S.-owned, Italian-built Harmony module, the forward-most part of the space station, which has two of the outpost’s astronaut sleeping berths. It launched in October 2007 aboard the shuttle Discovery on the STS-120 mission. A left turn into the Japanese Kibo laboratory comes next. Kibo, which means hope in Japanese, is one of the largest modules on the International Space Station and was launched by the shuttle Discovery’s STS-124 mission in May 2008. At the far end of Kibo, the video shows an external airlock used to transfer experiments and CubeSats outside the space station. After exiting Kibo, the camera floats through Harmony again to reach the European Space Agency’s Columbus science lab mounted on the opposite side of the station. Attached to the station on the shuttle Atlantis’ STS-122 mission in February 2008, Columbus primarily contains research hardware, including a facility called Biolab for experiments on micro-organisms, cells and plants. Returning to the Destiny lab, the video shows the Microgravity Science Glovebox used for experiments involving hazardous materials and another robotic arm workstation. The next module seen is the Quest airlock bolted to the side of the Unity node. 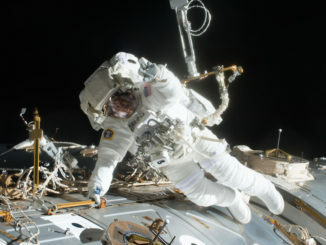 Two U.S. spacesuits for spacewalks are seen inside the airlock, which launched on the STS-104 mission aboard the shuttle Atlantis in July 2001. The video concludes with a pass through the Italian-built Tranquility module added to the space station on the same flight as the cupola by the shuttle Endeavour in 2010. On the right is the COLBERT treadmill, an exercise device named for comedian Stephen Colbert, who mounted a television campaign to win a public vote in a competition for the naming of the Tranquility module itself, then known as Node 3. NASA bypassed the Colbert name for Node 3, but honored the winning vote-getter with a new name for the treadmill, which is officially known as the Combined Operational Load-Bearing External Resistance Treadmill. As the tour returns to the cupola, there is a quick look into the Leonardo Permanent Multipurpose Module, a modified cargo and logistics module left on the space station by the shuttle Discovery’s STS-133 mission in February 2011 as a place to store spare parts, hardware and other equipment.